Located near the train station of Murten / Morat, the Restaurant Da Pino offers a fine vision of Italian cuisine that has been recognized by the Michelin guide. 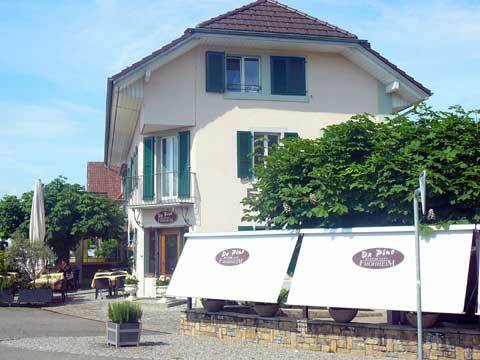 The restaurant Da Pino in Murten / Morat has not to be confused with a basic pizzeria. The cuisine associates the tradition of the Italian savors with a modern interpretation. The menu changes almost every month to keep up with the best seasonal product available. There will surely be some pasta in it, but depending on the season you could find also on it some lobster, lamb, tuna or the famous white truffles from Alba. Panna cotta and ice cream are stable items in the dessert list. The wine list of the restaurant Da Pino in Murten is impressive. You will find in it some of the best Italian wines like Ornellaia or Masseto associated to some most famous Bordeaux wineries. If the weather is fine, you will be able to enjoy your meal on the nice terrace. Da Pino is an excellent Italian restaurant in Murten with a gastronomic twist. You will love enjoying a wonderful plate of tuna carpaccio on the terrace in a warm summer night with a glas of fruity Italian wine.